Last ten days and Beard Club! After 2144 kilometers and 72 days, I am on the final stage of my challenge now. Cross your fingers please, that I’ll make it to Germany’s most southerly point in the next ten days! 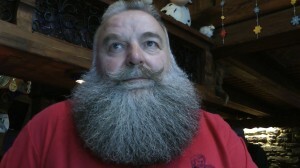 On my way, I have met another very German cultural aspect: Beards! Yes, the Germans love beards and especially the inhabitants of Schömberg. There’s even a Beard and Moustache Club. 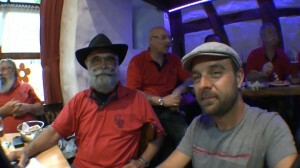 Five members hold the title of beard world champion! There are seventeen categories at the world championship level: Among them, the Kaiser beard, the Verdi or the Naturale category. Markus Bross, who holds several world championship titles, explained that they even have groupies at the world championship, but most of them are well over fifty. Here’s the real star, Franz Pill: He holds three World championship titles, seven Euro titles and he is six times winner at the German championships! Anyway, I had to see for myself whether wearing different beards might help have have a little success with the ladies. I tried on a blond curly beard, a moustache and a grey and long beard. Unfortunately, approaching the ladies of Schömberg with a long beard and mustache, I was rejected by the. But I was successful wearing ablond and curly beard. 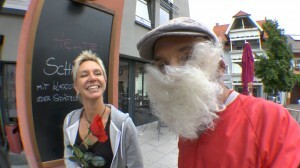 The nice lady accepted my rose and even went for a coffee with me.